Data Privacy Day: How are you Safeguarding your Data? Monday, January 28th, is Data Privacy Day. Commemorating the international treaty dealing with privacy and data protection, Data Privacy Day was created to increase awareness of privacy, educate consumers on controlling their digital footprint and share best strategies for protecting consumers’ data. The National Cyber Security Alliance (NCSA) officially leads the Data Privacy Day campaign and this year the focus will be on the value of information with the core message of, “Personal Information is like money. Value it. Protect it.” The NCSA also provides tips and education resources to help companies and consumers be mindful of what they share at work, home and in their community. As many are more concerned about their data privacy now than they were a few years ago, Data Privacy Day is a good day to review smart cyber-security practices and remember how valuable your information is. An accounting firm’s servers and backups were encrypted by ransomware. The firm was unable to access records and perform work for three days, but never received a ransom request. The firm’s IT contractor restored system access and recovered some files, but the records of 225 clients were unrecoverable and had to be recreated. 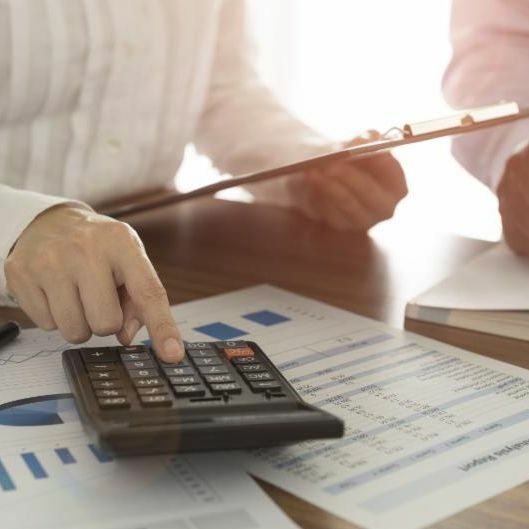 Cyber insurance paid over $63,700 under the Network Asset Protection coverage component for the costs to recreate the lost data and the income loss resulting from the 3-day business interruption. A few months later, the IRS alerted the firm of 11 fraudulently filed client tax returns. An IT forensic investigation concluded that the fraudulent tax returns were likely filed with client information that hackers exfiltrated from the firm’s computer system in the earlier ransomware event. 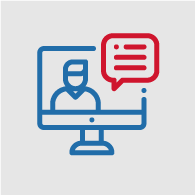 Cyber insurance paid over $48,800 under the Privacy Breach Response Costs coverage component for IT forensics, a call center, breach notification costs, credit monitoring, and attorneys’ fees to draft the notification letters and provide breach guidance to the firm. Overall, Cyber insurance paid over $112,500 for the claim. 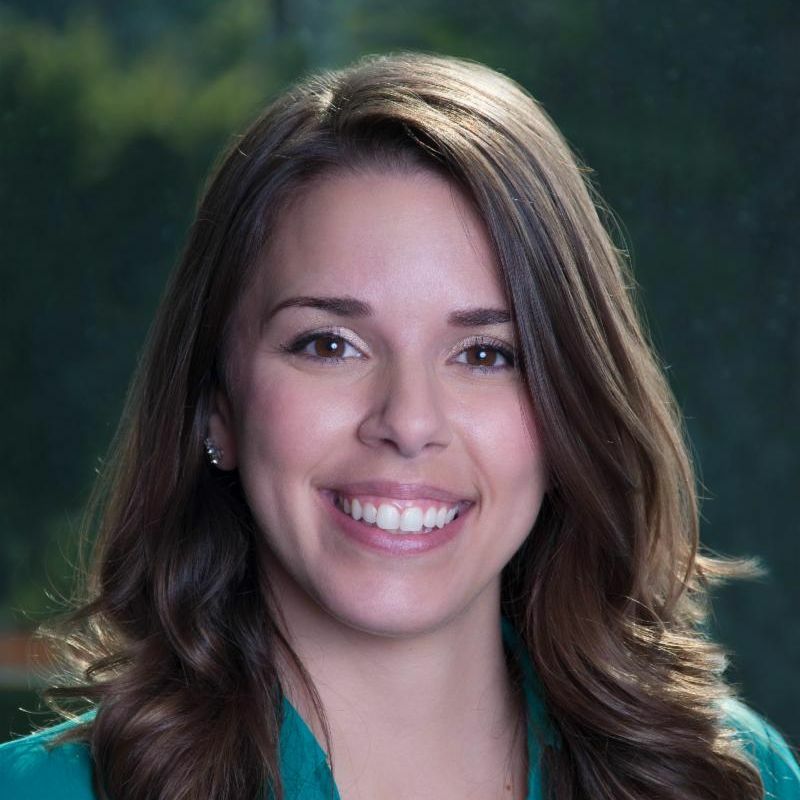 Amanda joined NAS in 2014 after earning her degree in Finance from California State University, Northridge. Currently, Amanda is an Assistant Vice President of Cyber Liability and Technology E&O. Amanda’s roots are in Southern California but she is always on the go! Even when she’s traveling, you can be sure to find her sprinting on the treadmill in the nearest Barry’s Bootcamp. Make sure your clients are cyber strong! For ballpark estimates, customized quotes and managing renewals, sign in to NAS Online and start quoting today. 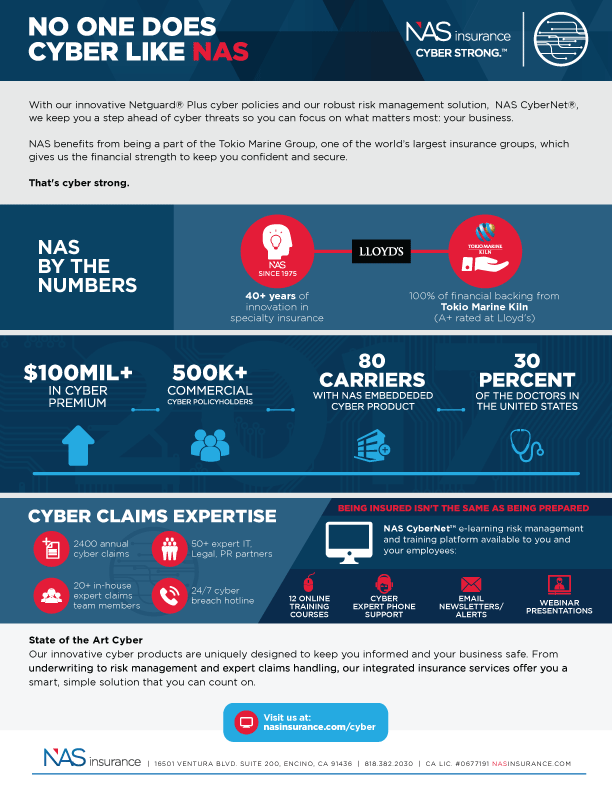 NAS Insurance Services, LLC today announces the release of their most expansive commercial cyber liability insurance policy update ever. NAS Insurance Services is a full-service specialty insurance underwriting manager that provides innovative product development, underwriting, marketing, risk management, and claims handling services for a broad range of specialty products that are distributed as both insurance and reinsurance solutions. It’s officially Cyber Security Awareness month, and while I’m not sure who is still out of the loop on all the cyber security threats lately (maybe that guy over there in the phone booth! ), we thought it’d be the right time to remind folks that to be Cyber Strong means to be Cyber Ready! Given recent hurricanes and earthquakes, the idea of preparedness in the event of a disaster makes good sense. Similarly, preparedness in the event of a cyber disaster should be on your to-do list this month too! As the leaves turn from summer green to the beautiful hues of Autumn, let’s turn Cyber Security Awareness Month into Cyber Security Preparedness Month. Cyber Ready. Cyber Smart. Cyber Strong. For over 40 years, NAS has lead the industry with innovative products like NetGuard® Plus, Personal CyberPlus and NAS CyberNet® Risk Management. But what does Cyber Strong really mean? Check out this infographic below to see NAS by the numbers and share it with your colleagues and clients. NAS Insurance today announced its expansion to New York City with the addition of Peter Hedberg as the Assistant Vice President of its Tech and Cyber Underwriting division. Hedberg’s arrival marks the growth of NAS Insurance into its 5th major metropolitan area, including headquarters in Los Angeles, and underwriting offices in Atlanta, Boston, Chicago and now New York. In this new role, Hedberg will oversee the production of NAS’ Tech E&O and Cyber Liability business for the New York market. He will focus his efforts on managing NAS’ relationships with area producers and growing NAS’ presence in New York. NAS Insurance is a full-service specialty insurance underwriting manager that provides innovative product development, underwriting, marketing, risk management, and claims handling services for a broad range of specialty products that are distributed as both insurance and reinsurance solutions.